Tiny roses, large roses, all sizes of roses! 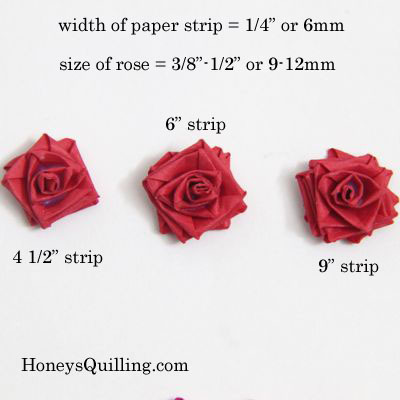 If you are doing a paper quilled project that needs some roses, you may be wondering just how to get the size and look you want. I already posted a tutorial on how to create a paper quilled rose. 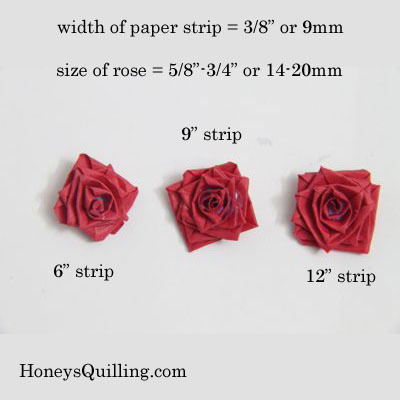 Now I am going to share how roses look when made with different widths and lengths of paper. 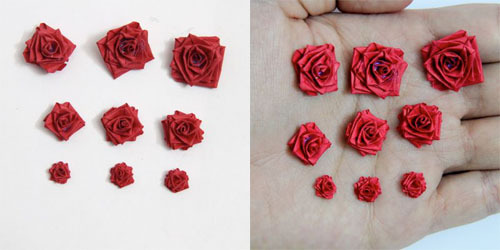 The most common size that I use for my jewelry is 1/8″ (3mm) width paper to make a tiny rose. This gives me roses that are approximately 1/4″ (6mm) in diameter. 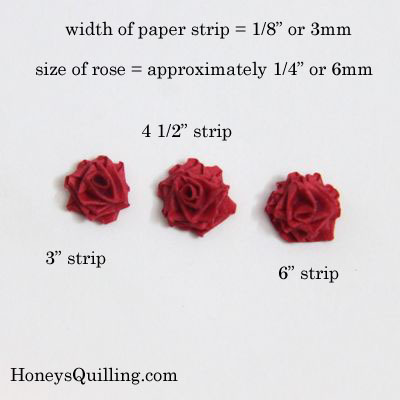 Here are three roses made from different lengths of 1/8″ width paper. You’ll notice from the photo that the rose mad with the 3″ strip is visibly smaller in size. The other two are approximately the same size. The difference between the 4 1/2″ and 6″ strip was that the rose made from the 6″ strip is taller. It was also a bit more difficult to spread it out for the petals to look nicely. My favorite is the 4 1/2″ strip. The 3″ strip also makes a nice rose, though, and I usually use it for my jewelry for the tiny size. Again you notice that the rose made with the smallest strip is visibly smaller, while the others are approximately the same. The rose made with the 9″ strip was taller and again a bit more difficult to spread out. You can kind of see on the left side of the 9″ strip rose that there are several petals all one on top of the other. I would suggest that for this width of paper to use a strip that is somewhere between 6 and 9″ long. Sometimes it just depends on the individual rose and how you fold it as you are making it. The last size that I made was with 3/8″ or 9mm width paper. For this width of paper it was more clear that there were 3 different sizes, as the 12″ strip rose was visibly a bit larger than the 9″ strip rose. That could be because the 9″ strip rose has a bit of a tighter middle, though. After you fold a rose you can kind of manipulate it by holding the base and turning the inner petals clockwise or counterclockwise to get it to look the way you want it to. This can result in a looser rose or a more tightly wound rose and it can affect the size. If you are making a rose with this width of paper, think about how large you want it and whether you want it to look newly opened or fully bloomed. That will help you decide how long to make your paper strip. You can always start with a 12″ strip and then stop when you think the rose is large enough, just cut or carefully rip off the excess paper strip. I hope that you have found this helpful for your quilled rose projects. You can, of course, use wider strips for even larger roses! Remember to check out this other post for the tutorial on how to make a paper quilled rose! Let me know if you have any questions about paper quilled roses and I’d be happy to answer them in further posts! This is very useful also for a beginner like me! You’re wonderful! Thank you so much! a video wud hav helpd much more… it was not perfectly clear for me.. how to make roses.. Yes, I agree that a video would be great, and plan on making some in the future! I not only appreciate your quilling but also your generousity in sharing your work. Thank you.